We arrived after a hot and dusty 5 hour drive, at the northern most edge of the Thar desert and the city of Bikaner. It was once a major trade centre on the silk route and is still famous for its camels and medieval old city. We are staying at the Laxmi Niwas Palace, not in the city proper but slightly out in the country and right beside a major military air base. There was heavy fighter jet activity taking off and landing right next door and directly overhead it seemed. Fortunately they were quite civilized and didn’t start until 8 ish or so – I say fortunately as once again my room was on the rooftop. The hotel is quite amazing, with walls covered in photographs from the late 1800’s onwards and each has a short commentary on the history and people captured. You could literally spend days wandering through the hallways peering at things! I had a “cleansing” ale in the bar and gawked at all the hunting trophies. In the billiards room alone there were ten tiger skins, five lion and a multitude of mounted heads of water buffalo, antelope, ibex and the like. Anyway we headed out to see another fort, a camel breeding and research station, and the “highlight” of the day – the temple of Karni Mata in Deshnok. The story behind this particular temple is rather strange. 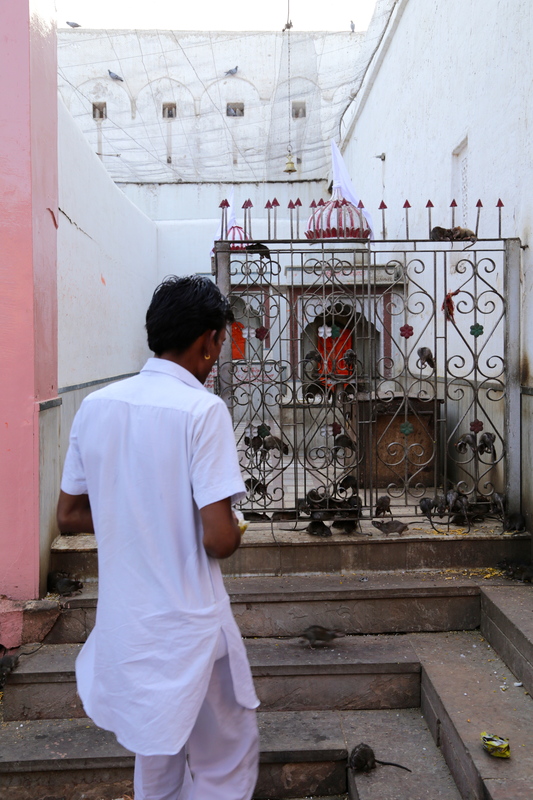 About 500 years ago there was a famous wise woman in the area who lost a child and appealed to the Lord Krishna to bring him or her back to life. Krishna refused saying he could not and that the child had to move forward on the wheel of life. The wise woman insisted and Krishna finally agreed telling her that if he did so the child would never be reborn on the wheel but be condemned to reincarnate as a rat. So to this day, the descendants of the wise woman are either the priests of the temple or the rats…. You enter through massive silver gates and there are thousands of rats – everywhere. They hang off gates and railings, cluster around bowls full of cane or coconut juice (possibly slightly fermented?) and others of maize, slide in and out of holes in the walls, scurry down corridors, climb the netting and curtains, basically to breed and die in place. It is awesome and bizarre in the extreme. People line up in a complete fervor to kiss the lintels they step over, leave offerings and gaze upon the shrine. Apparently there has never been a case of plague (?) or disease there since the shrine was established. I don’t know about that, but you can be sure that my feet got a – major – alcohol scrub when we returned to the hotel! The rats themselves didn’t really bother me much – when all is said and done they are just animals – rather scabrous, mangy and ratty (pardon the pun) looking but none-the-less. It is that people venerate this “wise woman” who condemned her descendants to this life completely outside one of the basic tenets of Hinduism – reincarnation! That is the part I find so very difficult to come to terms with really. Perhaps I am missing something…? What a strange story. And you’re right – it doesn’t seem to jive with what we understand about Hinduism. Perhaps that’s the key and the lesson itself. Rats! Equals Faith and consequences! Really interesting and surreal. Grace cannot look at these pictures as it reminds her if her early days teaching kids at the boys and girls clubs where the rats were a plenty. Over powering sense memory. As for the fighter jets saying good morning-eek. I Love the Canadian Illusion Bubble of peace that envelopes me at times indeed. The world is bigger than Yonge and Eglinton.